A massive flag comprising the islands in the region. A “historic” trip to Haiti featuring a large Caribbean contingent. A stage where both mainstream and up-and-coming artists have equal footing in prominence. Wining to your favourite soca artist one moment and liming with them the next into the wee hours of the morning. These were just a few of the unforgettable moments on board the third edition of UberSoca Cruise. Nowhere else can you experience such a fierce level of island pride, feel a sense of family with over 3,000 people, mixed in with nonstop feteing and soca other than at UberSoca Cruise. From November 1 to 9, passengers from the Caribbean, its Diaspora, Europe, Asia, and Africa all flocked on board to see, hear and taste a bit of the West Indies. 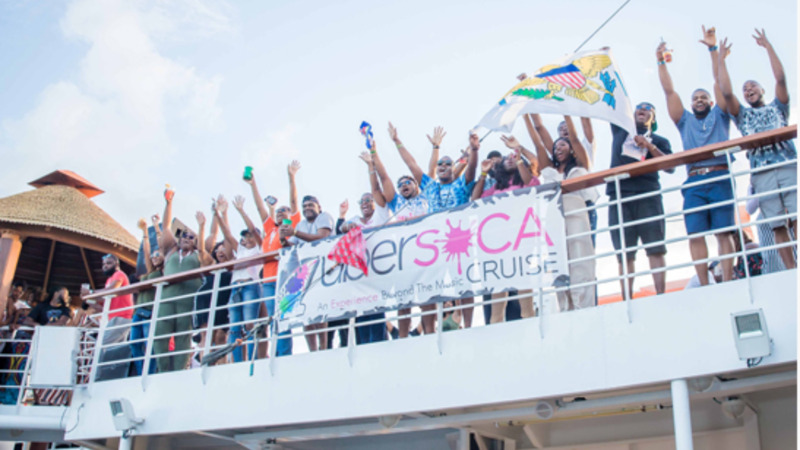 In just three years, UberSoca Cruise has solidified its place as a staple on the Carnival calendar, making it one of the most highly coveted soca events to experience. A testament to its demand lies in the fact that the cruise sold out just about a month after registration opened. Demand was so high that for the first time, a second back-to-back sailing was added. The five-day, four-night all-inclusive soca cruise to the private island of Labadee, Haiti included a rigorous itinerary, ranging from fetes and after parties (and after-after parties) to themed events and activities. 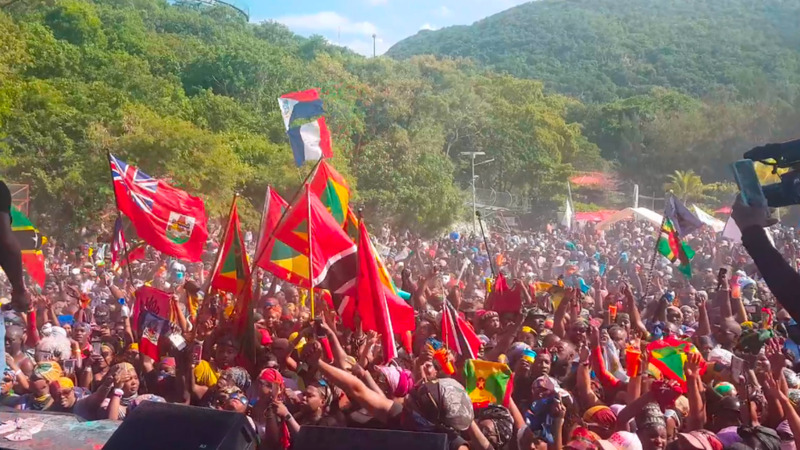 Guests enjoyed live performances from top soca artists from around the region including Kes The Band, Bunji Garlin, Lil Rick, Lil Natty and Thunder, Motto, Pumpa and more. The 14-deck, 311.1m (1,020ft) Royal Caribbean Mariner of the Seas was exclusively chartered for USC passengers, something that had never been for a soca event before. 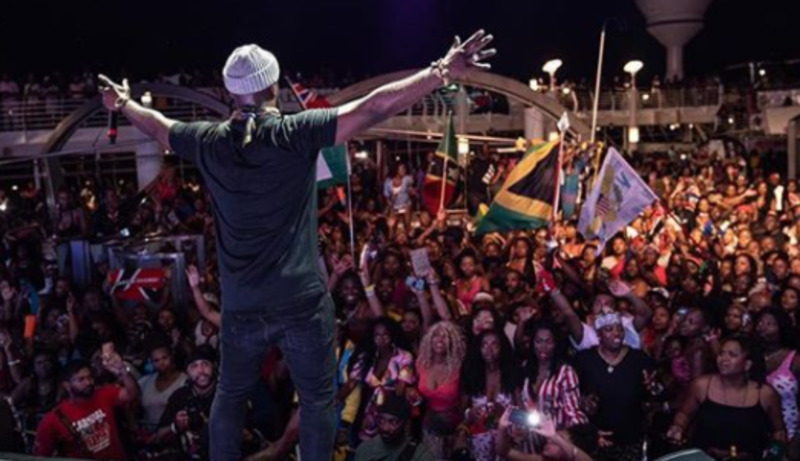 The significance of having such a large Caribbean delegation on a major cruise line where soca music is the star of the show truly speaks to the power of the genre. That, coupled with the ultra-luxurious layout of the ship that served as home for five days really helped to create quite the unique experience. When I was first invited to experience UberSoca Cruise, I didn’t know what to expect. Of course, I knew it would be a memorable journey, but I was, after all, attending for the first time and by myself. UberSoca boasted of 24 hours of nonstop feteing: could I make it to all? Would I truly enjoy myself pumping alone? All of my concerns were unfounded as, just as everyone who lives in the Caribbean knows, “yuh must bounce up somebody.” It was near impossible to remain solo for long as old friends were found and new were made on board. The near seamless experience kicked off with a pre-party in Miami the night before boarding. For the USC veterans, returning in 2018 was likened to returning to university after a long holiday: catching up with old friends, welcoming new ones and preparing for the semester (read: pump) ahead. With over 50 rostered events and activities, the onboard experience was exceptional. Each day centred around a theme, so, there was quite literally, something for everybody. Almost every hour of every day was consumed with a soca-themed element in entertainment, fitness, food, networking and even some education. Sleep was but a mere concept during those five days. A typical day for a guest can start with a Socacize workout session, followed by a bed-and-breakfast fete, before attempting to channel one's inner Nancy Kerrigan during UberSoca on Ice. After lunch, you can catch Kees and Farmer Nappy duke it out at a football match before taking a small lime on Deck 5 a.k.a. "The Avenue" with Voice before heading to a Game of Thrones-themed comedy show which culminates in its own after party. These activities only served as a warmup for the beach j'ouvert on the port of Labadee, Haiti. The day served as more than just one of paint, powder, and revelry, but also one of unity. At one point, a massive flag, comprised of a number of Caribbean flags made an arrival, making it one of the most poignant moments of the cruise. One of the sparks that made the experience is that the cruise allows guests and artists to interact in a way you never be able to at any Carnival or fete around the world. The literal and symbolic barrier that typically exists between the two melts away as soon as everyone gets on the ship. Indeed, it's not unusual to grab lunch with friends and end up eating with 5 Star Akil. "You meet people, they give you ideas, encouragement...you get love from all over the soca globe," soca artist Shal shared with us. On the high seas, it’s easy to see that the ship serves as an open playing ground for music and artists from across the islands. While it’s not unusual for mainstream artists to headline and dominate the stage at other events, it’s quite the opposite on the high seas. In just five days (10 days if you can handle the pace of both sailings) the music, fetes, food, and sense of family gives you a true taste of Caribbean culture and UberSoca Cruise is quickly positioning itself to be the evolution of the soca experience as we know it. To see highlights of UberSoca Cruise 2018 and find out which destination they'll be visiting in 2019, visit ubersocacruise.com and follow them on Instagram.